I connected an external monitor to my Macbook Air, and arranged it above the MBA display. See this screen arrangement. In the above screenshot, the up-display is the external display, and the down-display is the MBA display. I want to use the MBA display for my main working display, and occasionally put some reference windows in the external display. So, I want the menubar stay in the MBA display. The problem is that dragging a window from the MBA display to the external display does not move it. If a windows is somehow placed in the external display, I can drag it down to the MBA display. How can I move a window from the MBA display to the external display? I tried to arrange the displays physically up and down, but in the OS side by side. It is so confusing. So, I would opt out such an option. When dragging the window upward towards the top display, it will appear to be blocked by the menu bar. The solution is to keep dragging upward through the menu bar, and after a slight delay, the window will appear in the top display. If the reason you want to keep the menu bar in your lower display is to have easy access to your menu items, you might consider the app called MenuEverywhere from Binary Bakery. How do I move my menubar to an external monitor? How can I resize a Mac OS X app window after disconnecting from an external monitor? 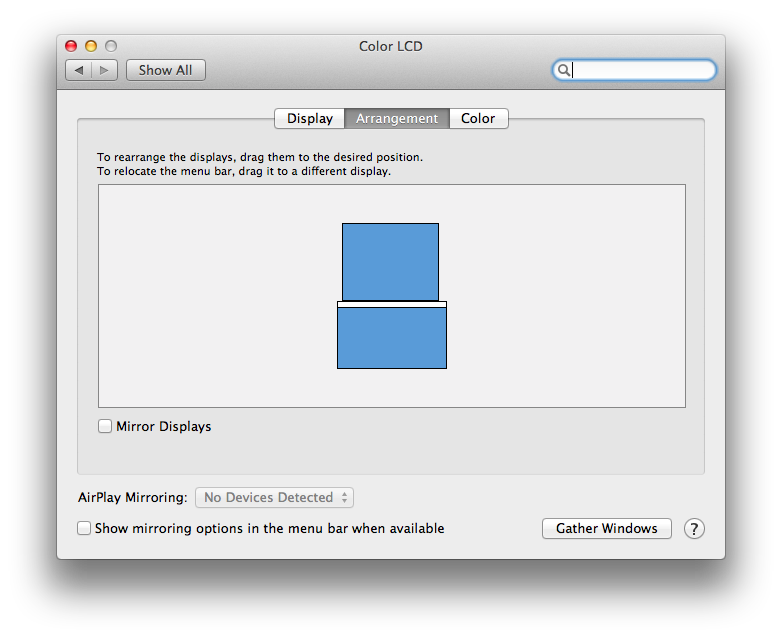 Was Apple menu 'sticking' for certain dual monitor setups removed in Lion?